As fate would have it, Delaware’s three breweries simply did not have the available capital and organization to endure the 13 long years of national Prohibition. As a result, larger breweries that were able to survive producing alternate products were much better positioned to take advantage of the open market after Repeal. While Delaware was the sixth state to ratify the 21st Amendment repealing Prohibition in 1933, new brewing companies were slow to organize in the state. Those that did attempt to make a go of it in the 1930s, faced stiff competition from ever-expanding regional and national breweries. Delaware’s post-Repeal breweries were at a distinct disadvantage in every regard. Consumer loyalty, which played a crucial role to Delaware breweries prior to Prohibition, was undermined. Ownership in saloon beer dispensaries served to guarantee sales for brewers prior to 1919 but was explicitly forbidden after Repeal. Barley shortages in the 1930s and 1940s also made it difficult for small breweries to compete with larger concerns, many of whom had first access to those supplies. As well, the larger regional and national brands had more availability to market their products across all forms of media in Delaware. The development of better roads and, eventually, a national highway system also made it easier and cheaper for the larger firms to transport their products into the First State. 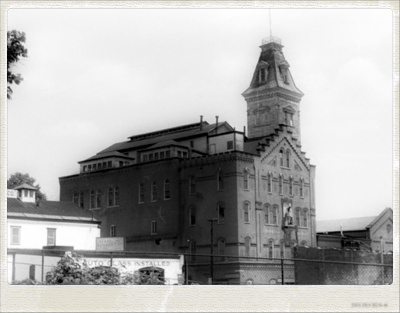 By the end of 1955, Delaware’s last brewery had closed. Industry consolidation assured that there would not be another brewery operating in Delaware for the next 40 years. In 1950, the Top 10 brewers accounted for 39% of US beer production. By 1980, the Top 10 produced 93% of the beer and the Top 2 produced nearly 50%. It would take changes in consumers’ tastes and state regulations before brewing could become a viable industry in Delaware again. The history as well as the architecture of the building were interesting to me. I just came across a very nice 35mm color slide of the front of the building taken by my father just prior to its demolition in 1962. I haven’t seen any other color photos on line. Hope you get the “King” restored!